Fayette County is not only famous for its horses, but also its livestock. Kentucky is the 8th largest cattle-producing state in the US. In our state 38,000 beef farmers raise approximately 2.2 million head of cattle, making it the largest cattle-producing state East of the Mississippi River. In addition to cattle raised for beef, Kentucky has 78,000 milking cows that produce approximately 135 million gallons of milk every year. The cattle industry contributes millions of dollars to Kentucky’s economy each year. The total cash receipts from cattle in Kentucky totaled over $750 million in 2011.During this period of time, prices for all classes of cattle reached historic highs with lighter calves fetching well over $2/pound and yearling cattle yielding $1000-$1200 gross back to local producers. It should come as no surprise that the Bluegrass Region has the largest assembly of cattle brokers in the Eastern United States. S&B Cattle Company, Eugene Barber and Sons, American Cattle, Conley Livestock and Brian Bogie Livestock are but a few of the major order buyers operating out of Central Kentucky. In 2011, the Blue Grass Stockyards handled over $110 million in cattle sales. Over 200,000 head of cattle were marketed with over 160,000 of them moving through the live auction in downtown Lexington and the balance being marketed over the internet for direct shipment from farm to buyer. The value of this industry stretches beyond that of cattle sales. In 2011, the payroll for Blue Grass Stockyards was over $2 million. The average production cost for a beef cow ranges from $450-600 per cow per year. Most of this production cost is captured by local farm suppliers, veterinarians and local feed dealers. These dollars turn many times in the local economy. Lexington is home to Market Management Services, which manages 7 livestock markets in Kentucky including Blue Grass Stockyards. These markets collectively sell over 500,000 cattle annually for producers from all of Kentucky and 9 other states. These businesses employ over 150 people and clear over $400 million in livestock transactions annually. Lexington, Kentucky truly is the hub of the cattle industry in the Eastern United States. The success and volume of this vital industry helps keep Central Kentucky green, beautiful and thriving. 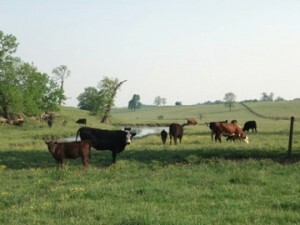 To learn more about cattle farming in the Bluegrass check out this video by Business Lexington.